This painting by Niels Larsen Stevns, a relatively unknown Danish painter, strikes me as profound. I think he portrays the occasion in a way John the Evangelist would have liked. First, notice the huge stone basins, which by their placement in the painting occupy the center of our attention. These vessels exceed what we might imagine when we hear the English word “jars.” Yet John, who is consistently focused on mystical and symbolic themes, takes care to tell us how these ‘jars’ hold twenty to thirty gallons each. To put that in perspective, 24” of water in a standard bathtub equals roughly 24 gallons. And Jesus transformed six times that amount, for just one party! 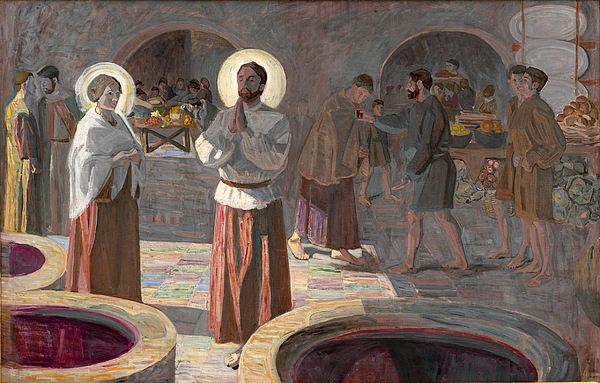 After the large vessels, we notice next Jesus and his mother, the two main figures in this painting and in John’s story. In addition to their placement, we can tell who they are by their halo’s. While Mary stands fully graced by the glow of the late afternoon sun, the upper torso of Jesus is in shadow. I think this is for both pictorial and theological reasons, allowing the glow of his halo to be all the more radiant. At the same time, he is the only figure in the painting portrayed as praying. Very subtly, and faithful to John’s Gospel, Stevns depicts how the light shines in the darkness, and that the darkness has not ‘comprehended’ it. This moment is all about Epiphany, about the revealing of light in new and profound ways, for the benefit of all who long to see it. Water, set aside for the purification of the body, becomes wine that warms and gladdens the heart and soul. The chief steward is just behind, being given an opportunity to apprehend and perceive the light. It comes in the form of a cup of wine, reckoned to be among “the best.” Also subtle is Stevn’s depiction of the two persons on the left side, who are in conversation. They appear to be discussing something whose meaning eludes them, reminding us of the two disciples later walking on the road to Emmaus. Like them, and like the chief steward, these two at Cana do not yet perceive what this is all about. Only in the background, under and through the low arches, do we see the wedding party, feasting together at the tables. Among many paintings of this scene, this may be among the most faithful to what John wants us to see, and to believe. This story, like the whole of John’s Gospel, is about the wedding of the human and the divine, in Jesus. Many guests at this wedding probably noticed the sudden arrival of a batch of fine wine—but not where it came from, nor what it represented. Those at the table were likely focused on the bridal couple, while enjoying all the splendid things on offer. But those who stood nearby, at the edges of the scene, were in a position to notice something else. Of greatest significance at this event was not the hospitality provided by the wedding hosts, whose wine in fact ran out! Most significant was the abundant and mystical hospitality, revealed and provided by a higher source. In this gathering, God’s hospitality is extended not so much as it is in other Gospel stories, to people who are unique and different, and on the margins. Here, God’s hospitality embraces what is common and the same, our needy human nature. God shows us how the deficiency we all share is blessed, and then filled. The empty vessels of our souls are ‘filled to the brim’ with the living water of the Holy Spirit. The Wedding at Cana by Niels Larsen Stevns (correct spelling! / 1864-1941), based on John 2:1-11. To see my homily, which explores this Gospel reading in relation to historical representations of it in art, click here.